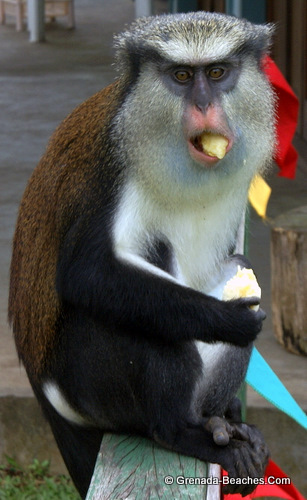 Do Grenadians Really Eat Mona Monkeys? 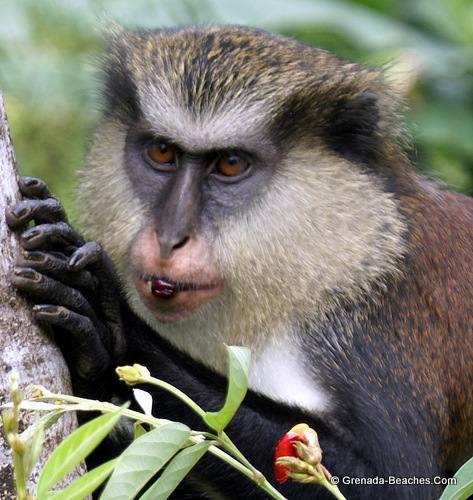 You are here: Home » Blog » Grenada Attractions » Do Grenadians Really Eat Mona Monkeys? The answer to that question is I don’t know… for sure. If seeing is believing, then I ‘m no believer, because I have not seen anyone commit this act. But I can tell you this much: I’ve met many who claim to have eaten Mona Monkey before. Is it just ole talk as we Grenadians will say? Is it some kind of bragging rights? I haven’t the faintest idea. But don’t you worry. You don’t run the risk of having a half rack of monkey ribs landing on your plate at your favorite Grenada Restaurant. To the best of my knowledge the Monkeys in Grenada are protected. And hunting them is outlawed. If this practice really do exist it most certainly is not widespread, and its done on the “down low” (in secret). They have a brown agouti back with a white rump, a black tail and black outer-parts on the limbs. They have cheek pouches in which to carry food while they forage. The face is a blue-gray color with a dark stripe running from each eye to each ear, a white forehead and a pink muzzle. 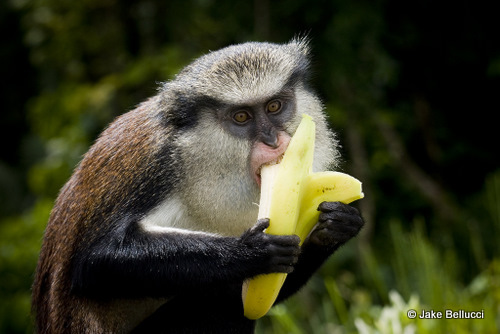 The monkeys feed mainly on fruits and plants, but are know to also eat insets. That explains why the Mona Monkeys in Grenada became so desperate and disillusioned after hurricane Ivan. Their habitat was left in total disarray, and they were forced to stray further than usual to find food. 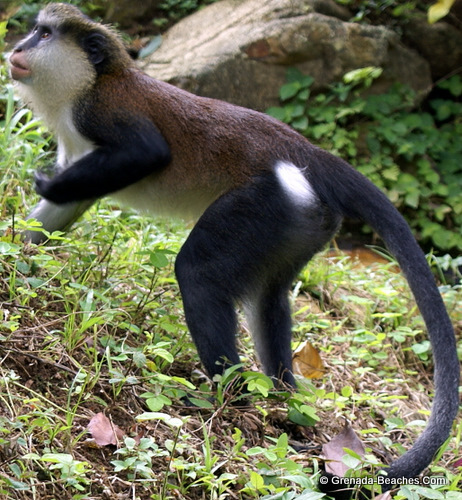 Many more Monkeys than normal were spotted in the months immediately after hurricane Ivan, and this sometimes led to confrontation with Grenadians. 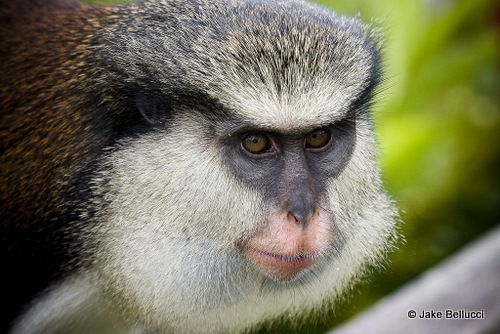 When you get to Grenada your best chance of seeing a Mona Monkey will be in Grand Etang. They really are a beautiful site, and they are not shy. You will also want to guard your stuff while they are around… it’s useless trying to chase a monkey through the bushes to retrieve your prized possession. 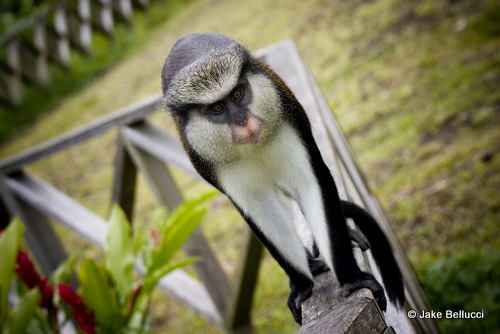 As far as I know Grenada is one of the few countries in the western hemisphere that have Mona Monkeys. They are a national treasure for everyone to admire (NOT eat). I hope you find as much joy in the Mona as I do when ever I see one. Many thanks to Jake Bellucci for graciously making his images (the first 3) available to this post. I just had a great experience with the Mona monkeys yesterday and today. At the Cocoa farm Chi Chi was of great entertainment…he loves objects to take and pulling on whatever is on your wrist. He let us hold his hand and pet him. Today at Grand Etang many of the Mona monkeys came to mingle with us (our group). I had fruit on my shoulder and one came down the tree limb, hung upside down and pulled on my hair and grabbed at the fruit. They let me pet them, hold hands and relax with them. Mona monkeys are amazing and they seem very domesticated. Love the Mona monkeys and I love Grenada. I can totally relate. You got to love the Mona Monkeys. So happy you are enjoying Grenada, do let us know about your other fun encounters or travel tips. Grenada will always be my home although I have left home now for 25yrs I take my wife and children home when we have the time,living in New york is nice owning my business is a blessing but there is no place like home .many thanks to the people of this website my children have learnt a great deal of their father”s home once again thank you and Ido look foward to visiting home this year to help contribute for the betterment of my country. I’m not sure about eating one but I’ll tell you this: Don’t try to pet one! They are quicker than a cat. On the way up to Grand Etang the guide pulled over into a parking area and fed the monkeys bananas. Along comes a teenager from the UK who asked if he could pet one. Choosing to reject the advice of the guide he did anyway. In a split second that Monkey spun around and glancingly raked him with this claws. The kid never had a chance as he exclaimed” the bloody thing got me!” I haven’t laughed that hard in years. Just one of the many memories I cherish when remembering the great island of Grenada. PS the kid was fine and better for it. I had a good laugh just reading it. I almost could have ended up like that kid. I was getting really close to one, taking pics when someone called out to me… I took their advice and backed off. Lovely creatures though. I can confirm to you that Grenadians eat monkey…You said seeing is believing,what about eating it yourself?..I think that is even better confirmation…And since I have eaten it already, and more than once,I confirm that it is true…..At this point now I can’t tell you if they are still hunted because as u rightly said they are now protected but I wouldn’t doubt that it is still done…..